The uncomfortable truth is seldom known and more rarely discussed; fish supplies in the United States contain fish caught by slaves forced to work long hours on trawling vessels (NPR Staff, 2015). While many think of slavery as a thing of the past, it is still very prominent and leaks into unsuspecting Americans lives. People do not know that by visiting the seafood department in their local chain supermarket, or by buying wet cat food, they are supporting unsustainably harvested fish products caught by slaves on trawl operations. Associated Press reporters serendipitously made one of the largest human rights discoveries of this century when they stumbled upon men locked in cages on a tropical island in Benjina, Indonesia (McDowell, Mason & Mendoza, 2015). What was lucky about it was the fact that one of the reporters spoke Burmese, and the majority of the slaves come from Burma (NPR Staff, 2015). People were begging for help as they explained the horrible conditions that they were subject to on a daily basis. The Associated press ran a yearlong investigation of this situation, and the results were quite disturbing. Many of the workers report abuse: being kicked, beaten, whipped with poisonous sting ray tails, maimed to a point of long term injury- some people are even killed (McDowell, Mason & Mendoza, 2015). The boats these people are forced to work on are trawling vessels where they must be on their feet for 20 to 22 hour shifts- all without adequate food and unclean water to drink (McDowell, Mason & Mendoza, 2015). This means that there are trawling vessels, which are extremely detrimental to the ocean floor and environment that are operating for 20-22 hours at a time. These are long, unregulated stretches of time where people are forced to partake in a very unsustainable fishing method. Associated Press reporters followed the cargo from a slave labor trawler, first via satellite to a Thai harbor, then in cars to factories, processing plants, and to the country’s largest fish market (McDowell, Mason & Mendoza, 2015). They found that several of these processing plants and factories ship to major retailers in the United States as well as several well-known cat food distributors. Though it was no longer possible to pinpoint exactly which fish was caught illegally, the United States fish supply is contaminated by fish caught by slaves in an extremely inhumane, unsustainable way (McDowell, Mason & Mendoza, 2015). Sustainability means partaking in activities that will not impact the ability of future generations to do the same, which is the opposite of current practices that are causing a decline in naturally occurring fish stocks. The magnitude of exploitation of global fisheries has caused about 25-30% of the world’s fishery populations to become overexploited or depleted, with a further 40% considered heavily to full exploited (Thrush and Dayton, 2002). The significance of this dramatic decline should be heavily considered for the future. An average person consumes approximately sixteen pounds of commercial fish and shellfish a year (National Fisheries Institute, 2015). If initiations towards more sustainable fishing methods worldwide are not acted upon, we as a global population will completely exhaust natural fish stocks, endangering food security. By installing a national grading standard and corresponding tax for the degree of harvest sustainability for seafood sold in chain supermarkets, we can minimize unsustainable practices and maximize consumer and retailer awareness. The ecological sustainability of fishing is determined by many factors, including the level and distribution of fishing effort with each gear type, population structure of harvested fish stocks, interactions between marine species, and environmental conditions (Pauly et al., 2002). Unfortunately, these factors are rarely adequately observed and described in the locations of major fisheries, and thus the push towards a more sustainable system remains an ongoing problem. The sustainable seafood movement to date has been largely concentrated on changing consumer demand in industrial countries rather than ensuring that production practices change worldwide (Iles, 2007). Due to the consumers inability to recognize the production conditions as harmful, producers lack the incentives to initiate change from their market. Educating consumers is an important step towards increasing the transparency of supermarkets’ modes of production. So ideally, the many intermediate points that occur throughout the fish product assembly process (from the ocean, all the way to the finished, packaged product) become easily recognizable to the average shopper. Supermarkets typically depend on institutions such as the Marine Stewardship Council (MSC), to be responsible for certifying the fisheries they source their products from. Currently, 94 fisheries are MSC-certified, accounting for 7% of the global catch (Jaquet et al., 2010). These programs have been developed to promote sustainable fisheries, but lack effective standards and credibility. An example of this is shown by Jacquet et al. (2010) who criticized the MSC for certifying their largest Pollock fisheries in 2009, even though the spawning biomass fell by 64% between 2004 and 2009 (p.29). Some larger chain supermarkets, such as Walmart, claim that they are sustainable because they only sell MSC certified seafood, yet when credibility of the certification is flawed, we still end up with unsustainable seafood on our dinner plates. While the process of engaging in foreign fisheries affairs may not be reachable just yet, we can start by addressing the local pressures we have placed on our own waters. For instance, the largest fisheries in the continental United States occur in waters off Alaska. This region supports a wide diversity of habitat types ranging from the extensive soft-bottom areas of the Bering Sea shelf to the complex high-relief habitats of the Aleutian Islands and portions of the Gulf of Alaska (Witherell & Woodby, 2005). Consequently, Alaskan fisheries that target ground fish, crab, and scallops all use specific fishing techniques that negatively impact the ecosystem. Such methods currently in use that been proven to be unsustainable include dredging for scallops, bottom trawling on soft-bottom habitats as well as use of pot gear and longlines that are dragged along the ocean bottom (Witherell & Woodby, 2005). Considering that an estimated 98% of all marine species live in or on the seafloor, it is alarming that the majority of these methods target the bottom so destructively (Thurman & Burton, 2001). The organisms that live at the seafloor are referred to as benthos, making up the extremely diverse and important benthic invertebrate community. The Alaskan region encompasses a wide range of ocean that could be targeted for harvest but still, fisheries should be encouraged to be conscious of the degree by which they are trawling, essentially “raking” organisms from untouched seafloor. This is due to the fact that the damage done by the first initial trawling instance is significantly higher, compared to the damage caused by subsequent trawls after. A study performed by Pikitch et al. (2004) showed that spatial zoning of destructive fishing gears to protect essential fish habitat, is a critical component of ecosystem-based fishery management. Meaning, that in order to limit the overall damage done to the seafloor, trawling zones must be exclusively limited to previously trawled areas rather than “fresh”, never before trawled areas zones. Besides the location of trawling, it is also important to consider the varying extent of damage that can occur due to the physical impact that fishing gears have on the seafloor. The severity of damage to the benthic community depends on the mass, the degree of contact and the speed at which dragging contact occurs (Thrush & Dayton, 2002). Mode of operation can play a huge a role in how many species other than the target species are being caught, also known as, bycatch. In the Alaskan region for instance, massacre to the seafloor in the effort to harvest scallops, a commonly sought-after supermarket delicacy, by dredging, poses direct harm to other benthic species. A scallop dredge is a heavy fishing gear which is towed along the bottom of the sea by a fishing boat in order to unearth as much of the product as possible. Ironically, according to the Alaska Fisheries Science Center, “dredges catch only 5-35% of scallops in their path, so paths are towed repeatedly during intense fishing seasons before vessels move to new fishing areas” (Heifetz, 2003). The main scallop species harvested, the Weathervane scallop, also overlaps in geographic distribution and habitat with a number of other important commercially fished species, including Tanner crabs – whose stocks are depressed and considered to be overfished throughout Alaska (Thrush & Dayton, 2002). While few attempts have been made to reduce the bycatch of benthic invertebrates, increasing emphasis on fishing management decisions directly compromises the bycatch and damage to the seabed biodiversity. Supermarkets in the United States are selling fishery products that are harvested at a serious cost to our ocean’s ecosystems. The oceans are being depleted and only a few large chain stores have taken measures to become aware and remove unsustainable fisheries products from their markets. There are several ways in which unsustainably caught fish will make its way into the global market. It goes unnoticed when illegal trades are made between boats in the ocean, or the contaminated fish are mixed with fish that were caught with valid fishing methods at processing plants (McDowell, Mason & Mendoza 2015). Once these fish are sold to wholesalers in the U.S., they are distributed far and wide. One example is a wholesale fish distributor from Boston Massachusetts, Stavis Seafoods. “Wholesalers like Stavis sell packages of fish, branded and unbranded, that can end up on supermarket shelves with a private label or house brand. Stavis’ customers also include Sysco, the largest food distributor in the U.S.; there is no clear way to know which particular fish was sold to them” (McDowell, Mason & Mendoza 2015). There is no way of knowing exactly how much of the seafood supply is caught by impractical and destructive measures, but any amount is too much. Unsustainably caught fish are unregulated and uninvestigated, leading to their presence in prominent grocery stores. Those who have chosen to conquer the ignorance, have crucially demonstrated that marketing sustainably caught fish is feasible. A well-known example is Whole Foods Market, who are involved with the Monterey Bay Seafood Watch program. Whole Food’s decided to remove all the fisheries products that are in the “avoid” red category advised by this program (Tepper, 2012). With the help of corporate and federal partnerships, more supermarkets may make a change. A case of this occurred in 2004, when Wegman Food Markets decided to partner with Environmental Defense in order to determine which seafood to offer in its 67 New York State and Pennsylvania stores (Iles, 2007). Although it may not seem greatly significant, protocol like this is the key to institutionalizing preconditions that can alter production to more sustainable, ecosystem- based objectives. Additionally, partnerships and catch shares have encouraged development in such protocol for the market to pursue greener fish. For example in 2005, the New England Aquarium negotiated a deal with Ahold Supermarkets to change sourcing practices according to the Aquarium’s sound fishing advice (Leadbitter, 2008). We propose a nationwide grading system based on sustainability of seafood products sold in chain supermarkets. To measure sustainability, classification of fisheries will be based on the fishing methods (which includes inquiry into fishing gears used, levels of bycatch, etc. ), their level of productivity and their environmental impacts. There will be a tax corresponding to the origin of the stores seafood products purchased for resale. The criteria will be similar to the Monterey Bay Seafood Watch program and Marine Stewardship Council, but much more transparent and clearly defined to the public. This will be a national system overseen by government agencies, so that markets throughout the country will have no choice but to comply with the national sustainable grading system. For the purpose of customers be able to easily recognize the severity of the practice required to catch their favorites fish, agencies will enforce packaging specification using the colors red, yellow, and green stickers to label each individual products level of sustainability. High impact, high bycatch fisheries will be the red category on the national sustainability grading system. Being the most unsustainable, “red” fisheries will have the highest taxes required for the stores purchasing these seafood products. As mentioned, fisheries that are being over exploited or are declining will also follow under the red grading system category. We can urge that retailers should stop selling all endangered or threatened species unless they ensure the necessary changes are made to the fisheries and farms to guarantee sustainability and equitability. The next level in the grading system is yellow, which will also impose a tax to retailers, but to a lesser degree than the red category products. Yellow category includes fisheries that have some concern of declining population or that are harvested in a way that still indirectly implicates the environment, but to a significantly less degree that red category does. These may include gill net fishing or mid trawling (Monterey Bay Seafood Watch, 2015). The last level is the green standard certification, which will be applied to only sustainably run fish suppliers. These fisheries support stable fish populations by utilizing fishing methods with low impact and bycatch, such as hook and line, and sustainably farmed fish. It is our hope that by instating no tax on the “green” fish products, supermarkets would become more inclined to purchase these products, thus trying to reduce or even phase out unsustainable fishing methods (trawling, dredging, etc.). Holding the supermarkets accountable for a tax on the fishing methods brings up the question, how effective of a solution is it in reality going to be? It may lead supermarkets to purchase more sustainable fisheries products or, if they choose to purchase the unsustainable products anyway, may lead to raising the price of the product to cover the cost of the tax. We support a clause that would prohibit supermarkets from passing 100% of the price difference. We believe that by passing on part of the tax with slightly increased prices, the choice falls to consumers who now would be discouraged from purchasing unsustainable fishery products. This is not going to remove all unsustainable fishery products from the market. We believe that by going through the middlemen (retailers), some degree of responsibility is assigned and retailers and consumers are encouraged to choose sustainability. It is our hope that our national seafood products’ sustainable grading system will be similar to the beef grading system in terms of public acceptance. The United States Department of Agriculture developed and has overseen the beef grading system since 1917 (USDA, 2015). This system was put into place because the public wanted to know the quality of the meat they were consuming, which allowed for farmers to gain insight in producing quality meat cattle (Harris, Cross, & Savell, 1996). As meat industry once did, the fish industry now faces many ethical challenges, but it is sustainability that is required to be clearly defined in order to hold retailers liable for selling unsustainable seafood products. The tax to the retailers purchasing yellow and red list products for resale is very feasible. We currently have excise tax on many things sold today such as alcohol, tobacco products, and even hunting supplies. Depending on what state you live in you could be paying an extra four dollars for a pack of cigarettes (Boonn, A. 2014). There are both state and federal taxes on tobacco products. The taxes collected from a retailer buying red and yellow category seafood products should be taken and put into studies of fisheries and new technology to make more fisheries sustainable such as aquaculture. It will promote a feedback loop promoting sustainable fishery products. We are aware that there will be many people opposed of our proposal, such as fishermen, whose livelihood depends on these fisheries. Our grading system will help ensure more long term jobs because fishing sustainably will create and support healthy fisheries. Hopefully, if all fisheries get on board, the competition to catch the most will simmer out before it becomes too late. Some of the damage done to our oceans may take decades to recover, if humanity has not already pushed it too far. Keeping sustainability in mind we can make sure the fishermen will have jobs for many more years to come. The other opposition of our proposal we foresee is the resistance of supermarkets and consumers themselves. Supermarkets may not to be willing to pay more for seafood products they pay less for ordinarily, especially when it is on them to pay the tax. Supermarkets will have the option of only buying the products that have no tax. The need to conserve and properly manage future food stocks is more important than short term profit involved with supporting destructive fishing practices. Eventually the demand for unsustainable products will diminish due to higher prices. Retailers supplying the consumers demand will not have to worry about paying the extra tax, because their customers will be buying sustainably. The lack of regulation on harvesting products from our oceans present a serious problem for both our generation of fish consumers, as well as those to come. We rely heavily on the products and services that the ocean provides, the food we obtain from it being only one facet of this. There is a very serious need for humanity to crack down on the regulation of this common pool resource. By implementing a grading system, there is a chance that we will be able to save ourselves and future generations from the mass extinction of several fish species. Gone will be the days of tearing up the seafloor with unsustainable methods such as bottom trawling and dredging, and in will come the days of sustainably harvested food and environmental justice. Until that day, we must fight towards it. Holding stores accountable for what they are selling would be a huge leap for sustainability, for now the pressure falls on the consumer. “‘If Americans and Europeans are eating this fish, they should remember us’ said Hlaing Min, 30, a runaway slave from Benjina. ‘There must be a mountain of bones under the sea’” (McDowell, Mason & Mendoza 2015). We need to regulate and only accept sustainable practices, so that there is life left in the ocean, not just a mountain of bones. Leadbitter, D. (2008). Market-Based Mechanisms–Improving Fisheries Management?. Seafood Ecolabelling: Principles and Practice, 187-206. Pauly, D., V. Christensen, S. Guenette, T. J. Pitcher, U. Rashid Sumaila, C. J. Walters, R. Watson, and D. Zeller. (2002). 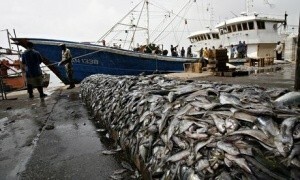 Towards sustainability in world fisheries. Nature 318: 689–695. Pikitch, E. K., Santora, C., Babcock, E. A., Bakun, A., Bonfil, R., Conover, D. O….. & Sainsbury, K. J. (2004). Ecosystem-based fishery management. Science(Washington), 305(5682), 346-347. Tepper, R. (2012). Whole foods seafood ban: Unsustainable fish no longer sold include skate and Atlantic cod. The Huffington Post, pp. 1. Thurman, H. V., & Burton, E. A. (1997). Introductory oceanography. Upper Saddle River (NJ): Prentice Hall. Thrush, S. F., & Dayton, P. K. (2002). Disturbance to marine benthic habitats by trawling and dredging: implications for marine biodiversity. Annual Review of Ecology and Systematics, pp. 449-473. Witherell, D., & Woodby, D. (2005). Application of marine protected areas for sustainable production and marine biodiversity off Alaska. Marine Fisheries Review, 67(1), 1-28.